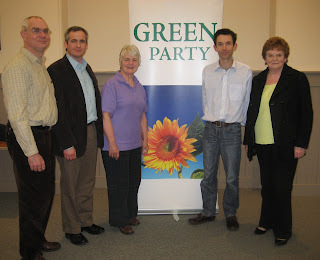 Lagan Valley Green Party was established on 24th March 2010 with an inaugural meeting at the Bridge Community Centre in Lisburn. The items discussed included: assigning various roles and responsibilities, the forthcoming General Election, the proposed Westfield shopping development at Sprucefield, the Glenavy incinerator and the proposed restructuring of the Northern Ireland local government areas. The Lagan Valley Green Party will operate as a local group within the Northern Ireland region of the Green Party Ireland. The five inaugural members were: Conor Quinn, Luke Robinson, Steven Wise, Veronica Browne, Nuala McAuley. Conor Quinn was elected Convenor and Secretary. Luke Robinson was elected treasurer.